Lavallette, New Jersey c.1962. Charlie Francesconi on left (bass player) and Paul Goldfinger (ie Gary) on right. In front of the Red Rail Restaurant. Last posted 2013. Bunny, I, Charlie (bass) and Frank (drums) warming up in Frank’s basement in Rutherford. We were college kids. Bunny and I were from FDU while Frank went to Seton Hall. Charlie was a precocious high school senior whose girlfriend was our groupie. Bunny rarely sang, but when she did, it was “Willow Weep for Me.” (We weeped for her singing.) Bunny was so slim that she could play between the white keys. Wallpaper compliments of Frank’s Mom. There are no recordings of our group. The Paul Gary quartet performed at college parties, bar mitzvahs, dances, bars and even a boat ride. We specialized in dance music. I played alto sax in the FDU jazz band, but it was a tenor in the photo above. Frank Cancellieri and I, from Rutherford, have been friends since 4th grade. Bunny Celmer was from Passaic while Charlie was from Paterson. We have stories from our one summer working in Lavallette. The Red Rail no longer exists. We were the only band at the shore that could play a cha cha or a fox trot and which did not feature rock and roll. Our music was mostly jazz tinged standards. Our theme song was “Almost Like Being in Love” from Brigadoon by Lerner and Loewe. This Johnny Hartman version is about the same tempo that we used, although ours was a bit faster–more suitable for the jitterbug. At the start of the evening we would play a chorus, and then I would speak into the mike while the music got softer, and I would say, “Good evening ladies and gentlemen. (or “ladies and germs.”) You are listening to the Paul Gary Quartet. We hope you have a wonderful time tonight, so step onto the dance floor and join the fun.” Then the volume would increase and I would play the melody on my Selmer tenor sax into the microphone. I loved to play into a mike–the sound would just float all over the place. 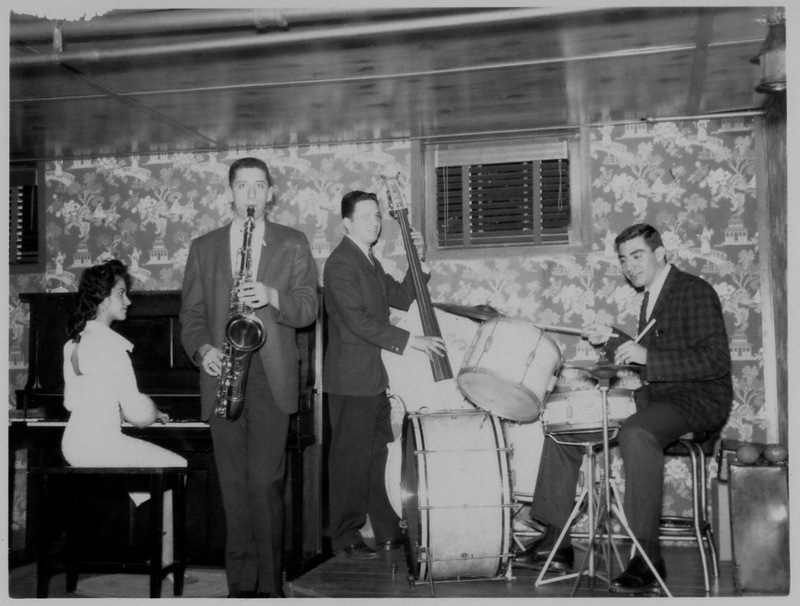 Did your group ever play with the Bernie Wyte Orchestra from Hillside NJ ? ?